These original hand-painted portraits created by Todd are looking for their forever homes. They were designed for the 2014 Celebrity Zodiac Series, Me&Todd Co.’s highly anticipated painting series-in-progress. If you are interested in purchasing one of these fine art pieces, please contact Todd via e-mail at me.and.todd@gmail.com to discuss payment and delivery options, or simply click the “Buy Now” button linked to each painting for PayPal options. For questions, or commission requests for new paintings, e-mail me.and.todd@gmail.com. @The_JenBrown is my buddy who happened to win this painting I did for a raffle at a benefit for our friend Wade. Jen Brown is a badass actress and vocal talent, and a sweetheart. 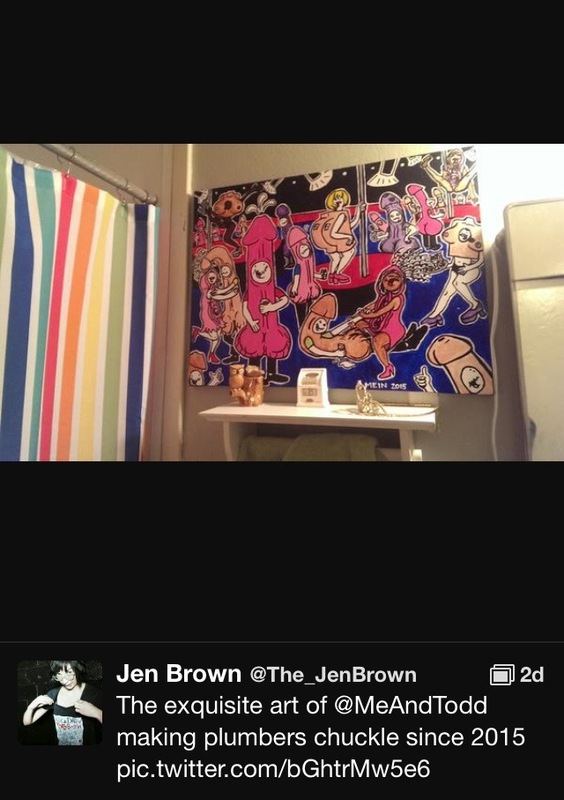 I am honored she won my painting, especially cuz I can go visit her any time and look at it (while I pee). You can read the tweet HERE.